The port is in the heart of the city. Up to two of the largest cruise ships can glide easily into port at the same time and tie up within sight of the bustling market, shops and cafes. No terminal is needed for passengers' services - all facilities are within a very short walk. Get to know Stavanger. Smiling, friendly Stavanger. Stavanger is a rich city - rich in culture, nature, experiences and good times! Lots of charm and sea breezes. The region has long claimed to be the cradle of the Vikings, and it is also where the Great Norwegian Fjords begins. In east the landscape varies between fjords and steep mountains, like the Lysefjord with Preikestolen - "the Pulpit Rock", is an hour boat trip from the city center. South is Jaeren, the flat open landscape, with long sandy beaches. The Stavanger Oil Museum is a very interesting building with fascinating information on Norway's oil industry. Displays of submersibles, drilling equipment, a mock oil platform, and audio-visual presentations make for a good few hours. The museum caters for all ages. Preikestolen (the pulpit rock) can be seen by boat or hiked up. It is an impressive geological feature that is prominent on almost every Stavanger postcard. It protrudes from the rock about 604 meters above the fjord and is almost totally flat on top. The view from the boat is less satisfying than the hike and a round trip takes several hours. Boats leave from the Vaagen (the harbor in the center of town.) The hike is moderate and the trail is well used especially during the summer. A good place for a photo opportunity are the Three Swords (Sverd i fjell, literally Swords in Stone), a monument outside the center of Stavanger, beside the Hafrsfjord. The swords themselves are massive and in the background is the fjord. The monument commemorates the battle of Hafrsfjord in the late 800's where Harald Hårfagre beat his eastern opposition and became the first King of Norway. Sculptures - In 2000 the mobile installation Another Place by British sculptor Anthony Gormley was placed on and off Sola beach. A few years later a new and permanent installation Broken Column by the same artist, was placed at various locations surrounding the center of Stavanger. The primary Lysefjord cruise company is Rødne: https://rodne.no/ You can find the schedule and prices on their website along with a map of their departure point, which is right near the cruise pier. If you decide to do it on your own, you might want to pre-book online to guarantee space, just in case they're the same operator the ship uses! 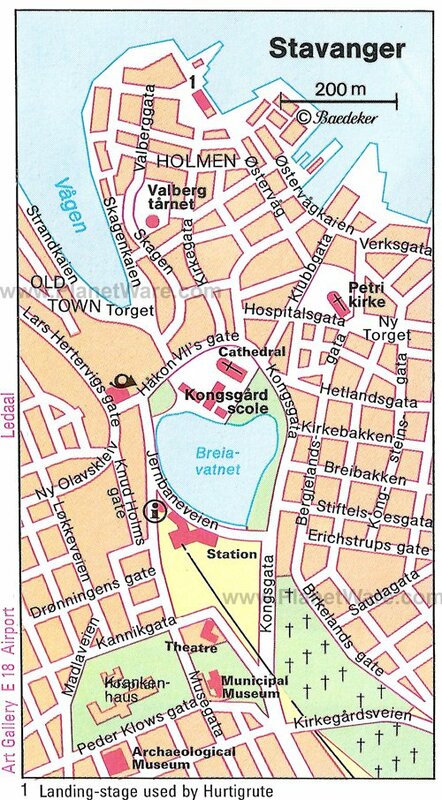 Stavanger is very walkable and there is no immediate need for taxi's, buses etc. Stavanger hop-on hop-off shore excursion. Cobbled pedestrian shopping streets abound with quality Norwegian goods – hand-knitted sweaters, wood, pewter, glass, ceramics and jewelry and gifts unique to Stavanger, such as replicas of Viking-age jewelry discovered in the area. Passengers can start with the market almost at the ships's gangway, absorb the atmosphere and then visit the Anglo- Norman style Cathedral, dating from 1125, a time when the town only had some 200 inhabitants. Both McDonalds and Burger King are only a short walk from your ship and provide free WiFi. At times you might be able to find an open Wifi connection on the open decks of your ship, depending at which pier you are docked.